Begin your Mediterranean adventure with a guided walk through Palma’s old town, passing the magnificent Catalan- Gothic cathedral. We embark the superb MV Aegean Odyssey in Palma, for five nights of spectacular cruising. We enjoy a relaxing day at sea and make use of the Aegean Odyssey’s excellent facilities. Our introduction to Andalucía begins in beautifully transformed Málaga with a panoramic drive through the city and a visit to the Picasso Museum and an afternoon at leisure. Discover Gibraltar’s stunning landscape, dominated by the Rock, plus its rich history with a cable car ride to Top Station, a drive through the nature reserve and a visit to the museum. We cruise through the narrow Strait of Gibraltar in time to explore ancient Cádiz the next day, with its wealth of historic buildings and monuments, such as the Baroque cathedral. We continue cruising along the Guadalquivir River, where the MV Aegean Odyssey has the chance to really shine as she makes her graceful entrance into the port of Seville to moor overnight. We disembark ship and take a tour of Seville with a local guide. The following day is free for you to explore captivating Seville. Perhaps discover the beautiful Moorish Alcázar palace and visit the outstanding Gothic cathedral, where the tomb of Christopher Columbus is housed. We drive through Andalucía’s picturesque countryside to discover dramatically sited Ronda, set on a ridge over a gorge, continuing to Mijas for our final night. Arrive at the airport for your flight to Palma. On arrival we transfer to the four-star Palma Bellver by Meliá for a one-night stay, with breakfast. Well-located on the promenade, the hotel has a restaurant, lobby bar and outdoor pool with a spacious terrace. 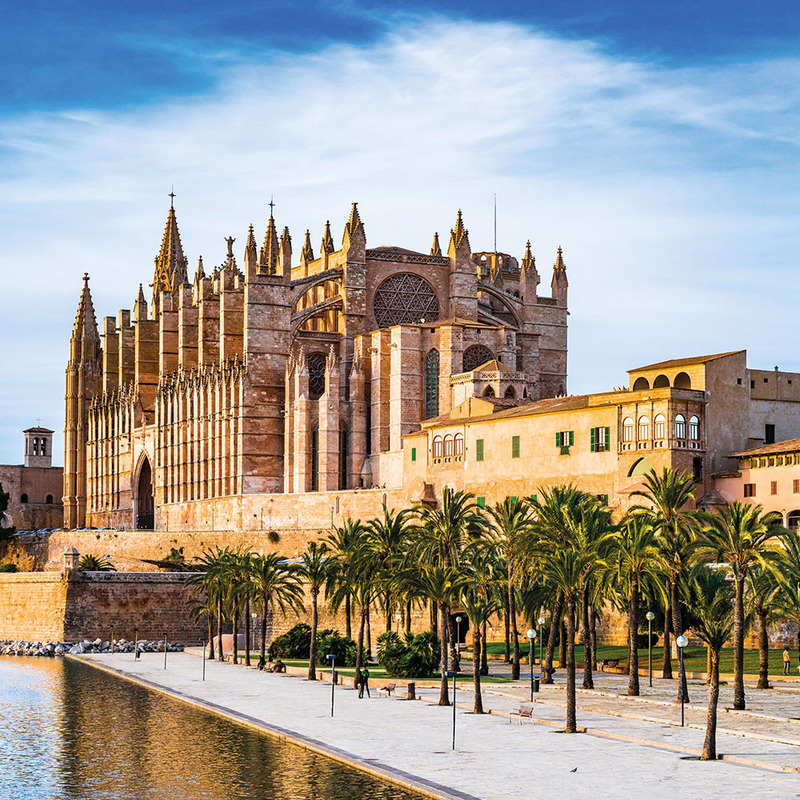 Start your Mediterranean discovery with a guided walk through the vibrant old quarter of Palma to its landmark Catalan-Gothic cathedral, whose towering sandstone walls and spear-like buttresses appear to rise out of the sea. ‘La Seu’, as it’s affectionately known to locals, boasts a 12-metre rose window made with 1,236 pieces of colourful stained glass. Architecture enthusiasts may be interested in observing the early 20th-century additions by Spanish architect Gaudí, who had the cathedral’s interior brightened and designed the ornate ‘baldachin’ that hangs over the altar. Lunch is at leisure, so take your pick from the many lively restaurants in this bustling city. Later we embark the superb Aegean Odyssey for five nights of spectacular cruising. As we cruise towards the continent, you have an entire day to relax and make use of the Aegean Odyssey’s excellent facilities. 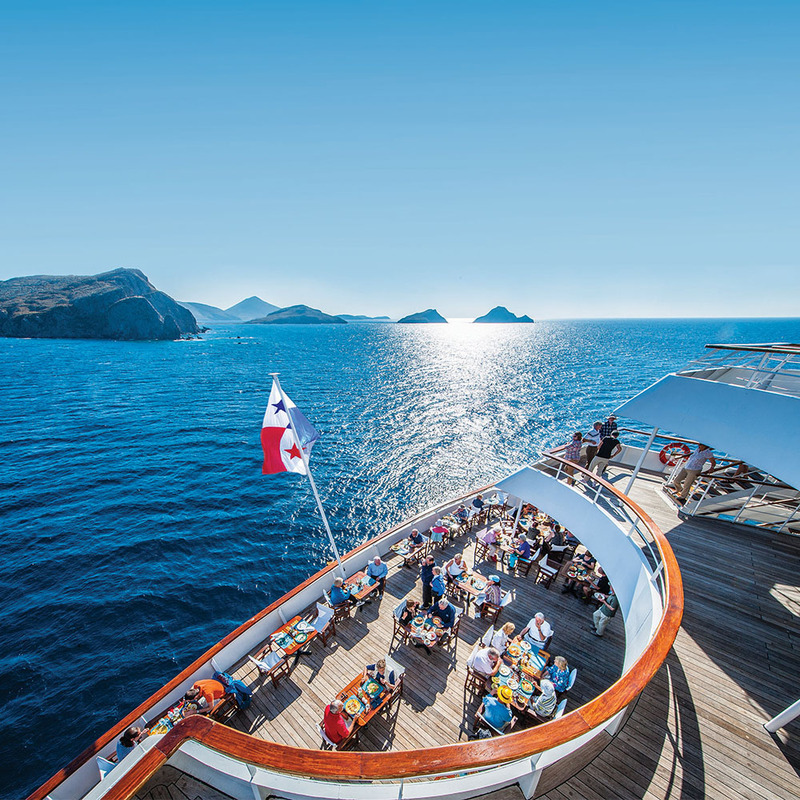 Take a dip in the pool on the Lido Deck, watch the spectacular sunset with your favourite cocktail at the bar, or find out more about the region at the ship’s cosy library. Perhaps listen to a thought-provoking talk by a celebrated guest speaker to get under the skin of the Mediterranean. This morning we find ourselves in glorious Andalucía, where the ceaseless glitter of the sun and the undimmed azure of the skies beautifully enhance the region’s fertile plains and jagged peaks. Our first port of call is Málaga, an eclectic city whose character is reflected in the skyline: church spires jostle for space with russet roofs, while Moorish hilltop fortifications stand sentinel over the harbour. The city is a master of reinvention with its wealth of fascinating new museums and galleries. During our panoramic drive, the city’s rich heritage is revealed through outstanding examples of ‘Mudejar’ architecture, such as magnificent Gibralfaro castle, the 19th-century bullring and the Alcazaba military fortification. 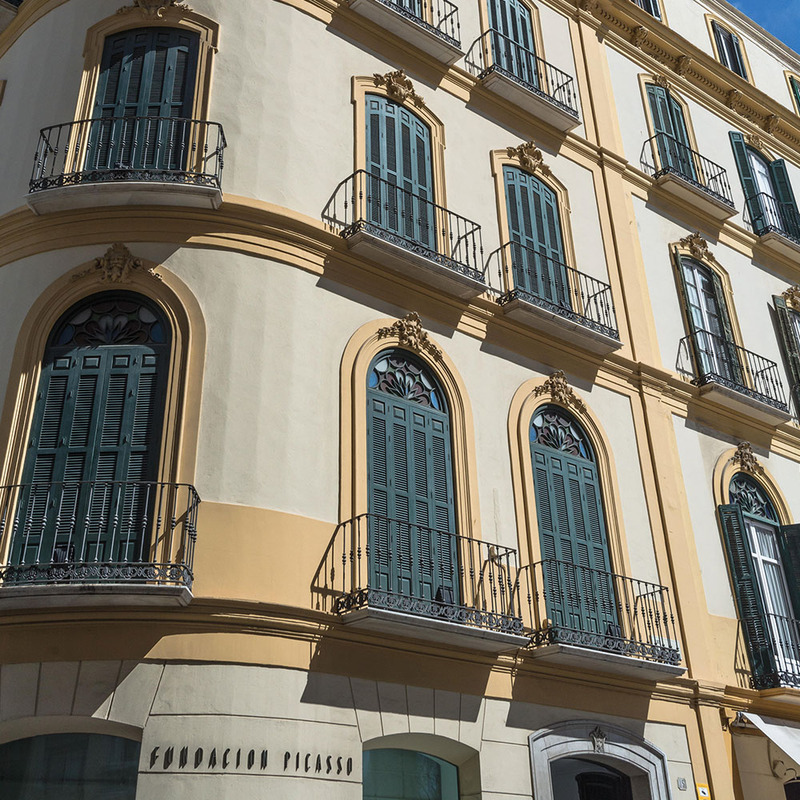 We also visit the museum dedicated to Málaga’s most famous son, Picasso. Housed in a grand 16th-century building are over 200 of his paintings, sculptures, drawings and ceramics, while the museum’s basement hides a delightful surprise – archaeological remains from Phoenician, Roman, Islamic and Renaissance periods were discovered here during construction. The rest of the day is at leisure. Perhaps visit the colourful Pompidou Centre, the only branch of Paris’ modern art museum outside France, or stroll the palm-lined walkways of the city’s beautiful park. Overnight we cruise to Gibraltar, a sliver on the Iberian Peninsula between the Mediterranean and the Atlantic. The day is devoted to discovering sunny Gibraltar, reassuringly familiar with its red pillar boxes yet curiously different. English, Spanish and an unofficial dialect that’s a mix of both are widely spoken here. 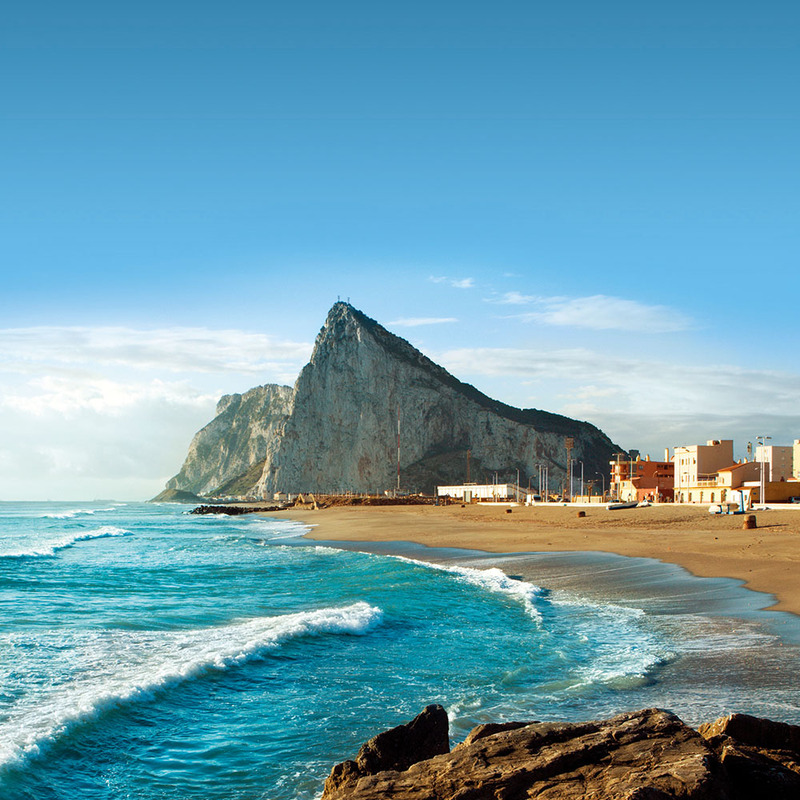 Gibraltar is best-known for the imposing Rock, one of the Pillars of Hercules in Greek myth but more astonishing is the fact that, towering at 1,400 feet, it’s made of Jurassic limestone some 200 million years old! We ride the cable car to Top Station at 1,351 feet above sea level for marvellous views over Europe and across to Africa. As we drive towards the nature reserve, we see Europa Point, a beacon for ancient mariners with the red-and white Trinity lighthouse, and its predecessor, the Shrine of Our Lady of Europe. We discover the Rock’s evolution through the famous Apes’ Den, home to Europe’s only free-roaming monkeys, and the Upper Galleries, which form part of the honeycombed interior and the defence during the Great Siege. Later we return to the town centre to visit the Gibraltar Museum, the perfect place to trace Gibraltar’s colourful history, from 127,000 years ago to the present day. Meet ‘Nana and Flint’, two accurate reconstructions of a Neanderthal woman and child, based on the skulls in Gibraltar. The museum itself was built on the site of 14thcentury Moorish baths. Tonight we cruise through the narrow Strait of Gibraltar with Morocco to port and Spain to starboard. 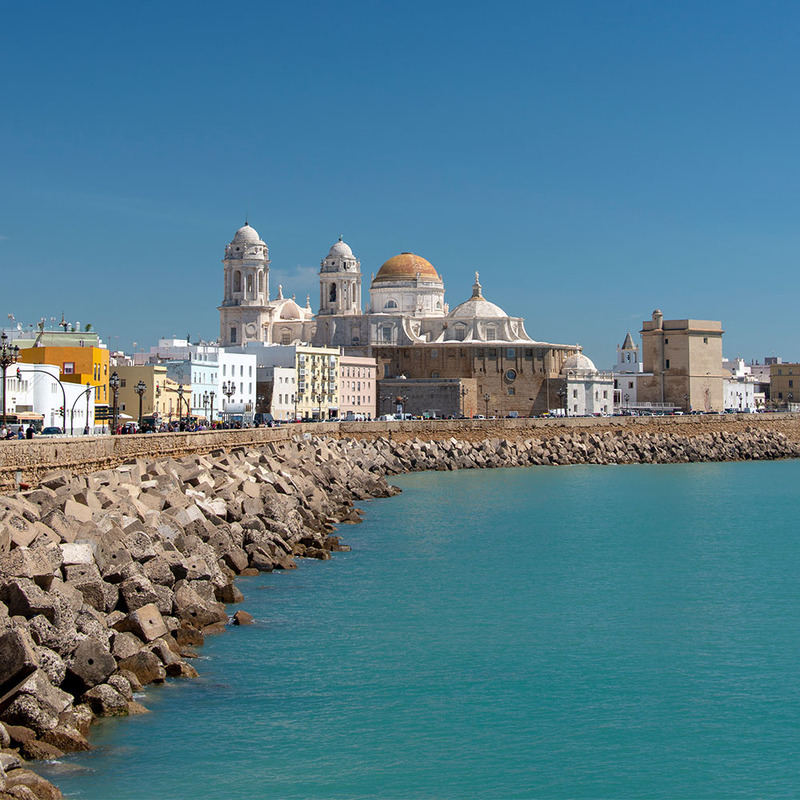 Today we arrive in the ancient port city of Cádiz, long considered a bridge between Europe and Africa. Clinging to the Atlantic coast, it was once the gateway to the Americas during the thrilling Age of Discovery. There’s plenty of time to stroll through the narrow lanes of the historic core while enjoying splendid views over the bay. 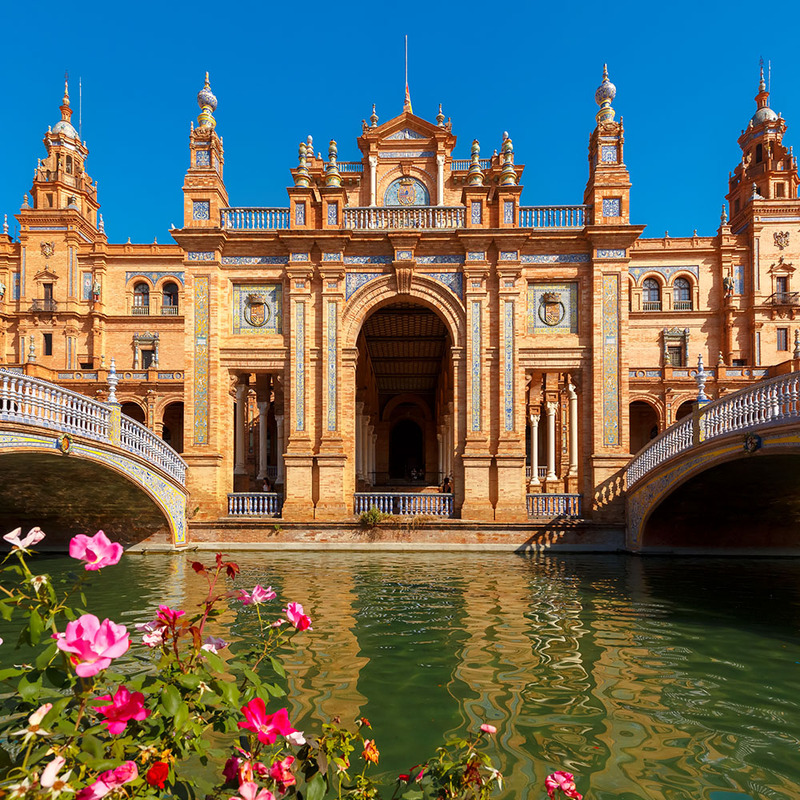 See the Plaza de España and its impressive monument to Spain’s first national assembly, visit the Baroque cathedral and be awed by its towering domes dominating the skyline, or stroll through the Moorish-style Alameda de Apodaca Gardens, a reminder of their long-lived legacy. We return to the ship this afternoon to continue our passage along the Guadalquivir River to Spain’s only inland port, Seville, retracing the voyage of ancient mariners. Later today the Aegean Odyssey has the chance to really shine – her modest size enables her to sail gracefully into the impressive port of Seville. 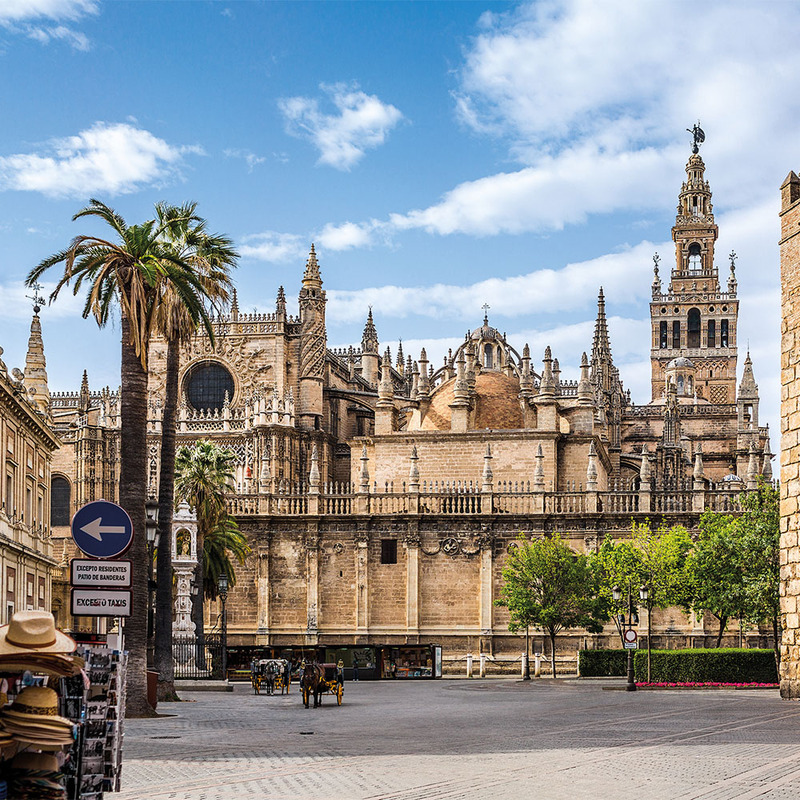 This morning, we disembark the Aegean Odyssey and enjoy a guided tour of captivating Seville. Founded by the Romans, the city was captured in the eighth century by the Moors, who left a fascinating legacy evidenced by the spectacular monuments we’ll see. Much of the city was built following the discovery of the New World and it seems to have changed little in the last 500 years. Admire the outstanding 15th-century Gothic cathedral, the third-largest in the world and built on the site of the great 12th-century Almohad mosque whose minaret, the Giralda, still towers beside it. Gaze up at the Tower of Gold, so named as it was used to store plunder from the Americas. After our insightful tour, we transfer to the three-star superior Hotel Don Paco for a two-night stay, with breakfast. Today is free for you to explore the city’s wealth of historic buildings, colourful side-streets and lovely parks. Perhaps visit the Alcázar, the enchanting fortified palace of the Moors with a richness of decoration that will astound you. Or wander around the Barrio Santa Cruz, the former Jewish quarter, and stroll through the beautiful Maria Luisa Park to the semi-circular Plaza de España, which was famously featured in several films including ‘Lawrence of Arabia’. This morning we drive into the hills through quiet countryside, where it’s not unusual to see eagles and vultures soaring above, or ibex roaming. 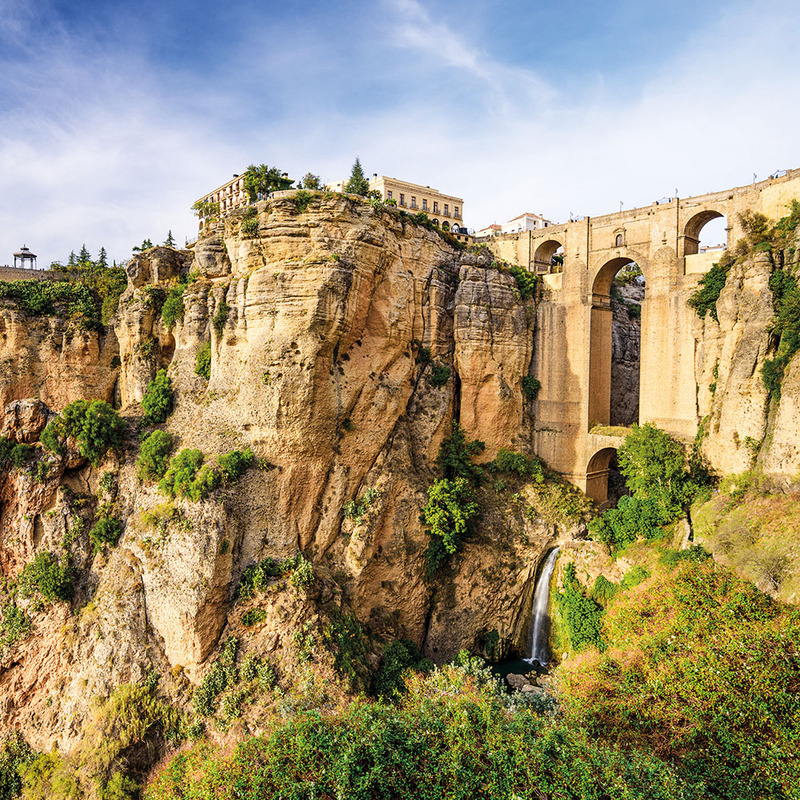 We stop in Ronda, which enjoys a setting so naturally dramatic it could be in a fairy tale. Built on a ridge and split by a most impressive gorge plunging hundreds of feet, the city’s two halves are joined by its iconic stone bridge. With plenty of good restaurants and a Moorish maze of cobbled alleys, Ronda is a splendid spot to spend a few hours. Later we continue through more of Andalucía’s scenic countryside to Mijas for an overnight stay, with breakfast, at the four-star Ilunion Hacienda del Sol. Once a modest village, Mijas has blossomed into a wealthy town spread across the rolling hills and the stunning coast, yet it retains an undeniable charm with its jumble of whitewashed houses adorned with pretty flowers. 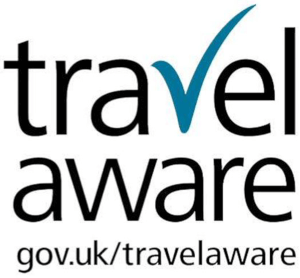 Transfer to Málaga airport for your return flight. The price of the holiday is per person based on two people sharing a cabin/room. Single prices shown are based on a single bedded cabin aboard the Aegean Odyssey and a twin room for sole occupancy in hotels. The price includes return flights, overseas transfers, seven nights aboard the Aegean Odyssey including all meals, four nights in hotels including breakfast, all tours and visits as detailed in the itinerary and the services of a Riviera Travel tour manager throughout.